A win and pole position at home was the result that Renault was after and it was French driver Alain Prost who obliged at Paul Ricard. Eight days earlier defending champion Keke Rosberg had won what was to be the last Race of Champions at Brands Hatch, but he did not carry that form to France and only qualified in 16th. As had been the case a year earlier, the Renaults dominated the front row. Prost made a cracking start but team-mate Eddie Cheever got wheelspin, allowing Prost to immediately build a big lead. Behind Cheever, Piquet was the danger and he moved into second on the 17th lap and the order remained that way for the rest of the race. The second Brabham was a retirement as Riccardo Patrese pulled into the pits with a dry radiator. The only things likely to rock the status quo were the pit stops and they proved chaotic and, at times, dangerous. Prost, less used to the art than Piquet, stalled the turbo engine and his pit stop briefly became one of panic. That stop lasted for 24 seconds whereas Piquet's was 16 seconds but it wasn't enough and Prost regained the lead on lap 33. 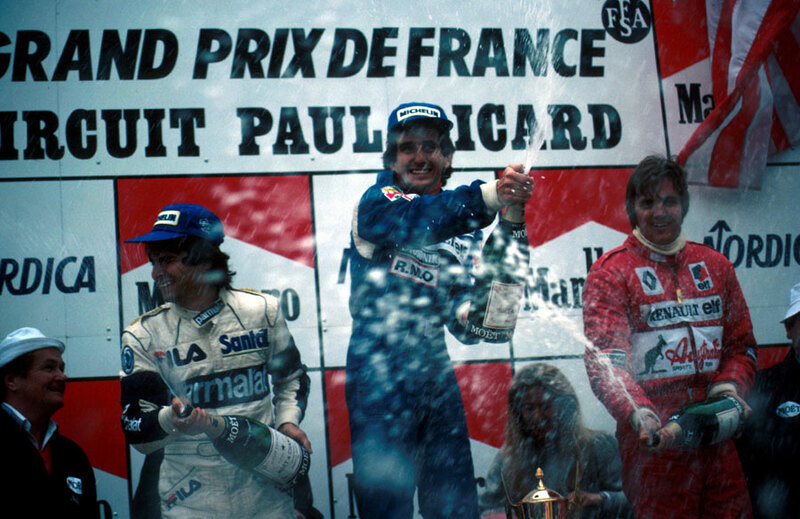 The gap extended as Piquet suffered from understeer but was still far enough ahead of Cheever to maintain second position with the second Renault taking the final podium spot. Patrick Tambay, whose Ferrari had broken down eight times in practice, was delighted with his fourth place. Several team bosses angrily hit out at the new mid-race pit stops for fuel and tyres. Gerard Larrouse, Renault's director, said the stops confused spectators and posed an unacceptable fire risk, while Ferrari's chief engineer Mauro Forghieri said it was ridiculous the drivers' championship could be decided on the skill and speed of his mechanics. Rosberg was more concerned about the danger to the pit crews as several times cars had come close to running over mechanics. He said when a driver slowed from 180mph to 60mph in the pit lane "it is very difficult for a driver to judge his speed accurately". Nigel Mansell's day was ended by his team-mate Elio de Angelis. As Mansell chatted with his mechanics, de Angelis ran over his foot and crushed his big toe. A doctor administered a freezing spray to numb the pain but the effects soon wore off and Mansell had to retire after six laps as he could not operate the clutch.